less thermal conductivity. As the insulation standards for housing become more stringent, cold bridgingthis is a pathway where heat can easily escape (or get in) through some part of the structure. It is usually caused by some element of structure such as a steel lintel or wooden studwork. Also known as a thermal bridge. see more on cold bridging becomes more of a problem and steel is a particularly poor insulator. This may be important in outside walls or at the bottom and top of columns. With PassivhausSee more on the Passivhaus standard. 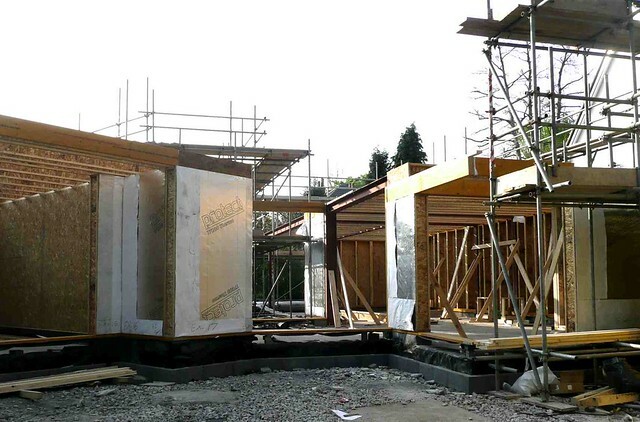 The PassivHaus Institute has pioneered a standard for low energy buildings. It includes very low energy usage and ways of achieving this. The word is derived from the idea of buildings which are fundamentally low energy and passive solar heated rather than using extra gadgets to heat them. See Passivhaus for the UK branch of the organisation. or code 6 standards it may be necessary to position the steel elements on the inside of the main envelope to avoid thermal bridgingthis is a pathway where heat can easily escape (or get in) through some part of the structure. It is usually caused by some element of structure such as a steel lintel or wooden studwork. Also known as a cold bridge. see more on thermal bridging. timber columns can usually go straight onto the foundation slab whereas steel requires fixing plates set in the concrete. The point here is that timber columns can be made slightly over length and trimmed on site whereas steel columns usually need nuts and studs or bolts with shims to make final adjustments. I wish to extend/add on a lounge room to a brick built duplex in the district of Kallaroo, Perth. Western Australia. I would like to build with either steel or wood framing with Ploystyrene insulation 75mm thick. with a solid concrete floor topped with cork or timber.